Trust problems can appear at any stage of a relationship, causing detrimental conflict and doubt to develop between two partners. Many people view trust as the most important part of a relationship, so when trust wanes, intimacy suffers. Trust problems can be caused by a variety of problems, such as cheating or even something small, like poor communication. During the therapy process, a counselor will first try to identify the source of mistrust, and then work with each couple to build better faith in each other and in the relationship itself. Another common sign of a struggling relationship is frequent, aggressive fighting. Although a disagreement or two is normal, constant yelling or even physical actions are toxic and dangerous. When arguments start at the drop of a pin, communication and conflict resolution become nearly impossible. If this scenario sounds like your relationship, consider working through your anger and issues together with the help of a couples counselor. Finally, the stress of just living life can create problems in relationships. Planning a marriage, raising a baby, or moving to a new home can all trigger problems in relationships that might have been dormant before the change. After or during big life event, consider seeking therapy to better handle the stress. Choosing to see a counselor before such events can also be effective. 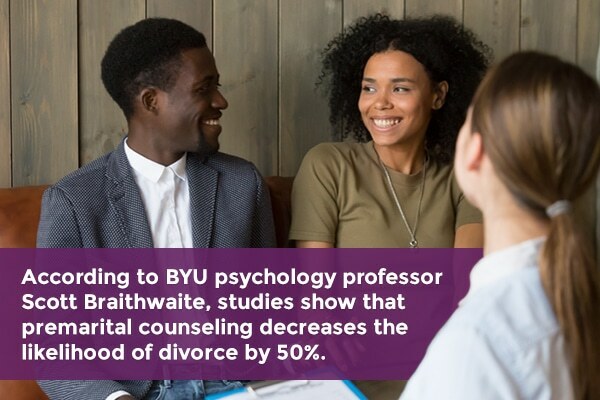 In fact, according to BYU psychology professor Scott Braithwaite, studies show that premarital counseling decreases the likelihood of divorce by 50%. Facing any problems in relationships can be devastating and confusing. While some problems may mend themselves naturally with time, others might require professional counseling help. If you’re experiencing any of the above intimacy struggles, consider scheduling an appointment with Keri Powell Therapy to help restore your relationship.